Ganseys are the traditional British fisherman’s sweater from the 19th century. Some of the techniques used in making a gansey sweater are included in this fingerless mitt. 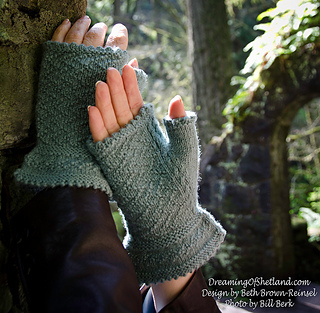 The Channel Island Cast-on and garter stitch welts will make up the gauntlet. Small cables and traditional knit/purl motifs are worked in the hand. A thumb gusset, reminiscent of the lower half of the classic gansey underarm gusset, is surrounded by the small baby cables. In addition, the lovely picot hem finish is included.